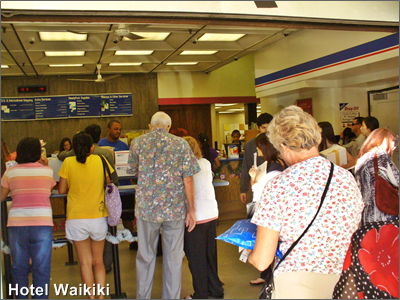 Tis' the season when people flock to the post office to mail their holiday presents early. By and large, if you don't make the same pilgrimage to the post office by next week to mail your own presents, the odds are you'll put it off to the 24th. Just like last year. A friendly reminder to people who re-gift presents that they've stored away a full year already .... don't mail it back by miscue to the same person who originally sent you the present. At least change the wrapping. Ho, the crowd. I mean, the revelry. The stars of the show were these the military men sending what I assumed to be holiday gifts to fellow troops stationed overseas. 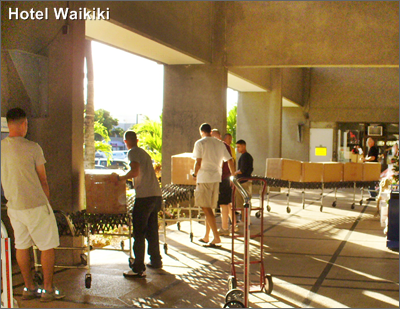 It seems that they must do this every year judging by the temporary conveyor belt that they had set up in advance that takes the parcels to just outside the front entrance where other soldiers carry it to the counter. I was talking to a postal employee and he told me that the soldiers had been doing this for over an hour already. The other end of the conveyor belt. Almost done. Thanks for the reminder. I gotta get cracking. Gosh... I don't have anything to regift. Our tai chi class is having a holiday party with a White Elephant. We're supposed to bring presents we've received that we didn't open. However, since we got rid of almost everything we absolutely did not need before we moved back here 2 years ago, we have nothing. What a weird feeling. Nice though. Kay- club get-togethers sound so great at first, then the day arrives and you think to yourself, why the heck did I say I was attending. Now everybody's expecting you there. All of my gift giving is local, no overseas mailing. And I don't mail Christmas cards, either. So this is one broad who won't step foot in a post office this month! We do internet postage and have the mailman pick up the boxes at our house. It is *the best. * No fun standing in a long line with a wiggly 18-month old. Ordered stamps online, too. 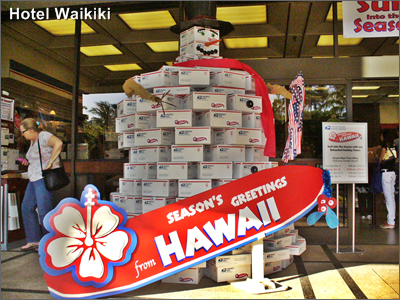 No body mails @ Christmas time like Hawaii people, LOL! gigi- I bet that the Post Office makes most of its revenue during the holiday season. Still in the red, overall, though. Ann- I heard about those Internet postal meters. Never tried it myself. I was under the impression that you had to do volumes of mailing. Too bad that CT doesn't have a personalized priority mail boxes, but your two senators have done more to damage the economy than the other 98 senators combined. Liberman with pulling the public option out of the health care reform bill the last minute to appease his 60th vote, and the other guy who, oh shucks, I forgot to huge ban bonuses in the bailout bill, yeah right. They should print their mug shots on the priority mail boxes. Both of them were running for president, too. Cloudia- the rest of the country is all about snow and more snow. 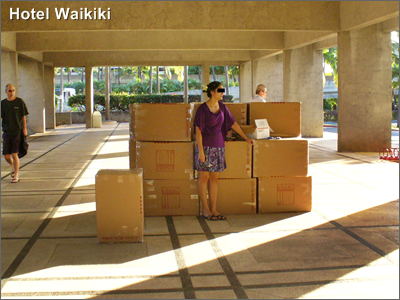 And yea, you live Ala Wai, I live Ala Wai. I have a package I have to mail out in the morning. I wonder if it'll make it from NYC to the Philippines before Christmas? I really need to pick up some Christmas cards to send out too. I suppose I'll do all that tomorrow. Brad- geez, I dunno. Perhaps, if you mail it out by this week. I got lazy. I'll mail it out later tomorrow (the 9th) on my way to work. It's ok though. I found some more stuff to put in the box.